The Queen of Wands is like a faceted stone that is struck by the light of the sun and creates a fabulous display of sparkle and color. She channels in the light of her creative passion to bring about something new. From ordinary things, something magnificent she creates. From sand and stones, she builds cities and cathedrals, from water and garden, a sumptuous feast, from needle and thread, tapestries and fashion. She is the creative force within every person that aims to be expressed in this world. Her energy is the overall drive that creates culture, art, fashion, theatre and innovation. It is that which drives humanity forward to grow, become better and evolve. She can be a powerful business woman, an entrepreneur, a fiery leader, a visionary, an artist and a seductress. Whatever she is, she is individual; a fiery Being who is able to bend and form her world according to her will. She is passionate because what she expresses comes from something real within herself. 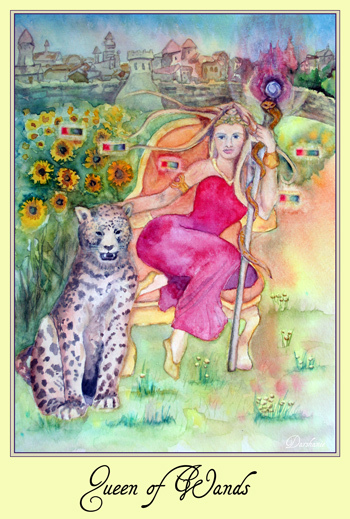 Just as the sun coaxes the flower out of the slumbering seed, bringing beauty and color into the world, the Queen of Wands is the life and passion that organizes her environment to achieve her own individual potential. Her inner sun, her Manipura chakra, is developed and active. It gently coaxes her soul potentials from its nebulous realms into form and into this world. Her life is her expression. Behind her is a thriving city. She is actively involved in the world and is totally plugged into the lives of man. The magnificent jaguar represents her passionate, powerful and creative nature. She lounges on her golden throne and is very comfortable with this wild beast at her side. She is holding a golden staff with a serpent coiling upwards that signifies the kundalini force directed and channeled according to her will. Around her are rainbows which show her use of color, light and frequency in creating her world. The sunflowers behind her represent her alignment with her soul. The sunflowers follow the sun, the soul of our solar system. They drink in the strength and beauty of their deity. They themselves are like little suns. 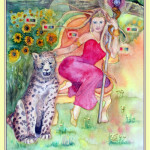 The Queen of Wands is strong, her body is muscular and powerful, her beauty is piercing and confident. She draws from her own soul source and shines its glory into the world. When you get this card it indicates the need to consult your own authority. Create to exercise your power to create. Create to experience what you are able to create. Create to become a creator. Feel your power by centering yourself within your perspective and letting the world fall into place around it. This entry was posted in Tarot, Wands on April 12, 2016 by darshanie.